When I watch news stories about people who thrive despite handicaps I'm always left wondering...So, what's my excuse? Yesterday morning on Good Morning America I saw a story about ten-year-old Zion Harvey who lost both of his hands when he was two years old. This kid is pretty amazing. His attitude was inspiring. And that was before he got new hands. He had learned not only to adapt, but to enjoy life, without hands - feeding himself, playing games and even strumming a guitar. At a press conference following an extraordinary surgery to attach two new hands, he called out his family to thank them for all the help and support they had provided. Wow! People without limbs, people like Nick Vujicic and people with extensive paralysis, such as Joni Eareckson Tada, are finding ways to live and impact the lives of others. 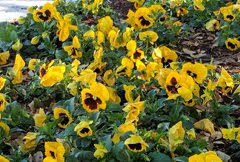 More importantly, they have an attitude of gratefulness in the midst of their limitations. I'm sure they get down, but their overriding outlook is positive. Their faith in God and his care for them gives them hope and helps them move their focus to others. When I'm tempted to come up with excuses for why I can't do something, I just need to think of these people to remember that excuses are for wimps. I am able ... to do just about anything I want to do, if I'm willing to work hard, focus and persist. I pray that God will help me to see the things that he has made me able to do. 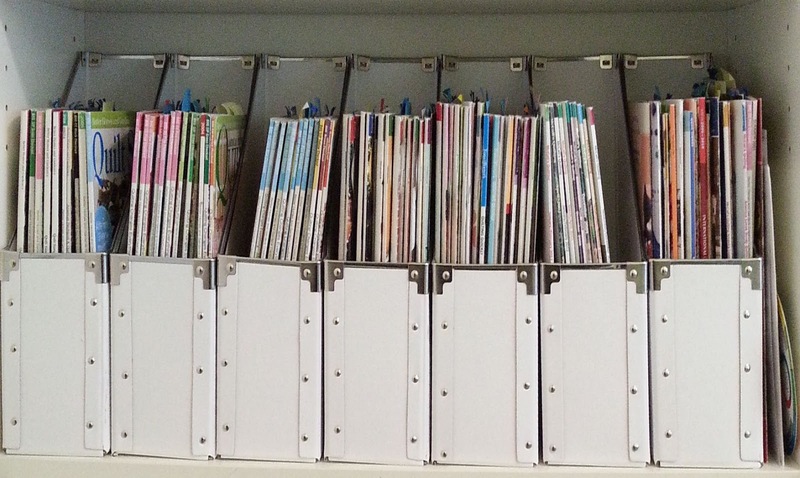 I'm constantly lamenting that I wished I could remember which patterns were in which magazines. Well...I think I've come up with a solution for this conundrum. I'm going to index the patterns that I like. This is a bit of an undertaking - no short-term project, to be sure. 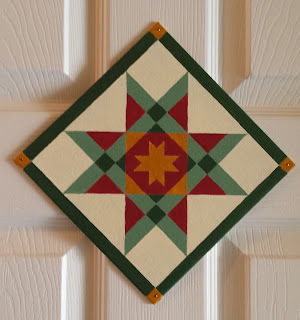 Go through each magazine and use a sticking not to mark the page of a quilt I like. After going through the magazine mark a / in the upper right corner of the cover, so I'll know which magazines I've gone through and which I still need to go through. Take a picture of the quilt in the magazine (choose the best option to show as much of the quilt as possible). Upload the images to my Flickr account. After uploading the images mark a \ in the upper right corner of the cover to create an X.
Edit each picture changing the name, adding a description that includes the magazine name, month and page number. Use the tag feature to note if it is easy, intermediate, difficult and whether it has other features such as being fat quarter friendly, scrappy, has stars, baby quilt, etc. When completely done mark one more line through the X on the front cover in the upper right to create a star and mark a dot at the top of the spine, so I'll know which magazines have been indexed. Now what I have is a searchable index of all the quilts I already have patterns for in my own collection. 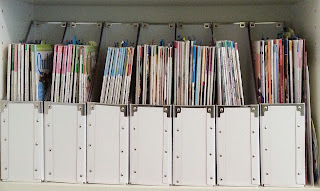 After going through the magazines, I plan to do the same with my pattern collections and even go through my books. I think this will help me to know what I have and even be able to share with others when they mention a need. I know I'll still purchase some patterns along the way. I hoping that by keeping organized and having a way to access what I already own, I'll make good use of the money I've already spent. So, this is the plan. We'll see how it goes. Taking inventory isn't always good. Talk about a slap in the face, reality check. I knew I had a lot of projects, but this is just too many. There are over fifty. Call them what you will - works in progress (wips), unfinished objects (ufos), projects in progress (pips). I've got them...in spades. Here they are, all wrangled into containers and stored in cubbies under my new cutting table. I've cataloged them and filed them on Evernote. Now, I guess I better get sewing on them. They aren't going to sew themselves. 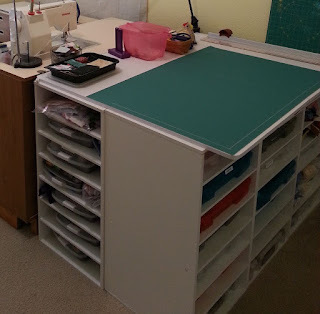 My sewing room has been a project for about 6 months. I have a new cutting table with storage underneath. A new sewing table with a side surface for ironing and shelves for storage. Pictures of those will be coming in the future. In this room is a rather large window that has white blinds. When I say large, I mean 72" x 78" - gigantic! 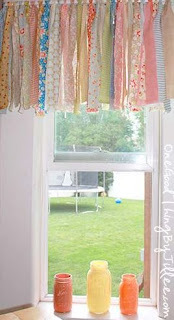 Inspired by this pin for a Shabby Chic Rag Valance (from Pinterest - see picture below), I tried to do the fabric strips tied to a curtain rod treatment. I don't have a picture to post, but trust me - It was a Pinterest fail. The proportions were off ...by a lot. It just wasn't working for me. So, it was back to the drawing board. I considered buying or making a valance. After traversing the local mall, as well as various big box stores, I determined that valances have gone out of style. I wasn't able to find a suitable option to purchase, nor was I happy with fabric choices (or very motivated) to make a valance. 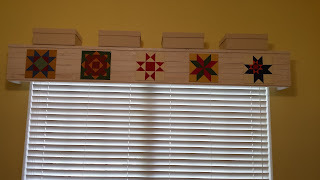 I was lamenting to my husband about these unfortunate events when he suggested that he could make a window box. Awesome! We had a window box at another house and it was wonderful. So, this is what he did for me. Not only did he make the window box, which is pretty cool all by itself. 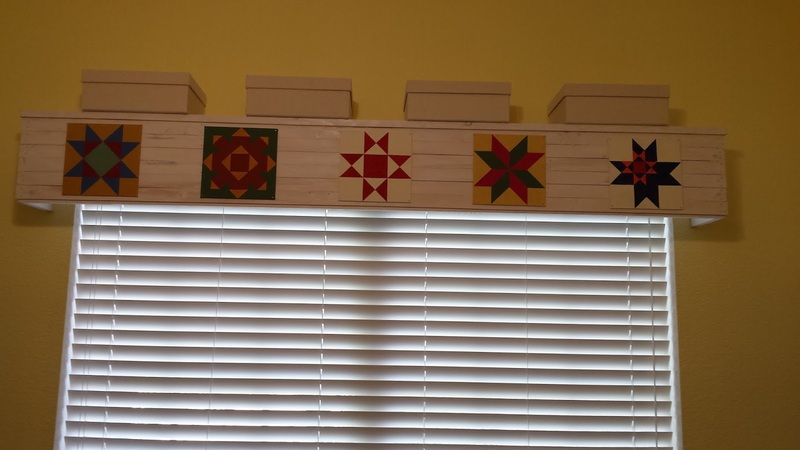 He also painted some quilt blocks like the kind you see on the sides of barns and nailed them to the window box. Because the canvases came in a six pack there was one left that he decided would be great to put in my door. I'm thankful for my handy husband.